Hotel del Parque is a stylish luxury hotel located in Guayaquil's Parque Historico, which includes a wildlife sanctuary, cultural atrraction and botanical gardens. The hotel itself is a gracious 19th century building that was originally a charity-run hospice in a different part of town. In the 1980s the shell of the building was painstakingly moved to its present position and meticulously renovated inside and out. The result is a stunning, characterful hotel, with elegant archways and porticos, cosy courtyards and opulent interiors. There are 44 rooms and suites, all beautifully furnished and equipped with 21st century comforts and conveniences such as smart TV, free Wi-Fi, USB plugs and air conditioning. Bathrooms have marble surfaces and large, walk-in showers. Toiletries, bathrobes and slippers are provided for every guest. All rooms are spacious, and the Park Suite is the epitome of luxury with a iving room, dining room and optional butler service. Casa Julian, the hotel's restaurant, is set in an adjacent building overlooking the Dual River. Cuisine is based on classic Ecuadorian dishes brought up-to-date by the skill, imagination and creativity of the chef and his team. As well as breakfast, lunch and dinner, you can enjoy afternoon tea here, a feast of sweet and savoury nibbles. It's also possible to arrange private meals in secluded locations around the park. Leisure time can be spent in the reading room where there are TVs and laptops and a free coffee and fruit juice, relaxing in one of the courtyards or indulging in a massage at the spa, housed in the old church belltower, which also holds the gym. The manifold attractions of the Parque Historico are on your doorstep and as a guest of the hotel you have unlimited access. They include nature trails, a wildlife sanctuary, historical buildings and cultural shows. Chocolate and coffee tours can be arranged, and you can have a guided tour of the herb garden. Downtown Guayaquil with its lively waterfront area, is a short drive away. Open: Hotel del Parque is open all year. Location: The hotel is in the riverside district of Samborondon, about a 15 minute drive from the city centre and just 10 minutes from Guayaquil airport. It is within the Parque Historico, a well-known cultural and recreational venue. Rooms: The 44 rooms are arranged over 2 floors and have TV, tea and coffee making facilities, a minibar, safe and alarm clock, and are furnished with modern and antique Ecuadorian items. They are decorated in mellow shades of grey and yellow. Bathrobes and slippers are provided for all guests. There are 5 categories of room: deluxe doubles range from 37 to 45sqm and have courtyard or garden views, deluxe king rooms have similar dimensions and overlook the garden, signature kings are 51-60sqm with garden views, the junior suite is 66sqm with its own lounge and faces the gardens, and can be combined with a signature king to form a 2-bedroom suite, and the park suite is 171sqm with a dining area, small kitchen, views of the park and comes with butler service. There is 24-hour room service. Activities: You can visit the Parque Historico where there are guided wildlife tours, architectural exhibits and occasional theatrical performances. Other activities offered here include a guided tour of the herb garden, learning about coffee production and chocolate tasting. There’s also a children’s scavenger hunt. The main city sites, including Malecon 2000, a shopping and recreational venue, churches, parks and museums, are within a short drive. Facilities: The reading room has a TV and laptops for guests use, and free coffee, juice and cakes in the morning. There are 2 inner courtyards with flowers and trees and seating where you can relax. The spa is housed in the former church belltower and offers beauty and health treatments (payable locally). There is a 24-hour concierge service. Dining: Breakfast, lunch, afternoon tea (Wednesday to Friday) and dinner are served in Casa Julian restaurant, in a 19th century building adjacent to the main hotel. The cuisine is traditional Ecuadorian with a modern interpretation. Private meals can be arranged in various locations in the park or in your room. Children: Children of all ages are welcome. A children’s menu is available on request. Youngsters can enjoy a scavenger hunt in the Parque Historico, and private tours of the animal sanctuary can be arranged for children. Health: This is not a malarial area. Communication: There free Wi-Fi internet access in all areas of the hotel. Notes: Hotel del Parque is a member of thw Worldhotels group. Let us help you plan your perfect tailor-made holiday to Ecuador. Talk to one of our travel experts. Tell us what you want, and we will tailor make your perfect trip. 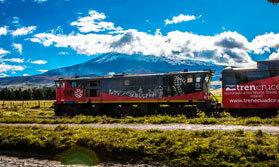 A stunning luxury train trip through the Andes and out to the Ecuadorian coast. "Difficult to comment in depth because we arrived much later than planned. As a result, we just about checked in, had room service, slept and had breakfast before leaving. It looked like a really nice place tho'."